North Andover, MA - Charles Construction Company Inc recently completed a turnkey fit up project for New England Community Acupuncture (NECA). Located at 27 Charles Street, the new 3,000 s/f tenant fit-up will be the second location for the practice. 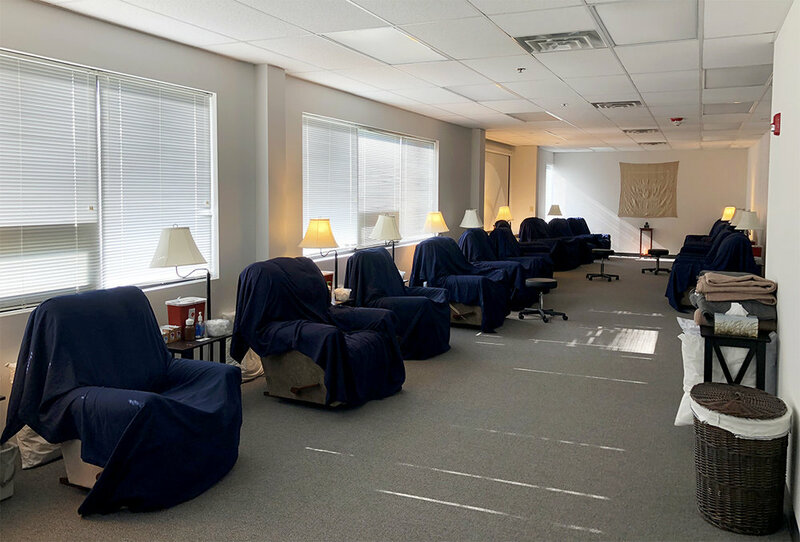 The new facility will consist of over 20 chairs and 10 beds being looked over by three acupuncturists, all of which are overseen by NECA’s owner/founder Matthew Prouty. The design of the practice reflects NECA’s relaxed, cost-effective healing philosophy; treating multiple ailments from sore, aching muscles to digestion and emotional disorders. Charles Construction Company Inc was contracted by Debra Mathias, of 27 Charles Street LLC the owner and manager of the property to acquire all permitting, architectural, engineering and design documents in order to deliver the ideal space for the new 10-year tenant. “The deal provided New England Community Acupuncture an opportunity to move into a larger space with an option to grow within the building. All parties worked closely together in order to create an ideal working environment for New England Community Acupuncture.” Says Bill McGowan, the procuring broker representing 27 Charles St LLC. The design team included of architect Miika Ebrell of Miika Ebrell Design and Steve Houle of McCabe Associates. Both of whom worked closely with superintendent Mike Noyes and project manager Alex Matses of Charles Construction to turn the space around in 8 weeks. The project began with comprehensive demolition to prep the space for its updated use, adding new restrooms and common area amenities for the tenant. The idea for the space was to convey a calming aesthetic by meticulously choosing the lighting, HVAC system, and color scheme for a relaxing and inviting atmosphere for their clients.